The national flag of Rwanda consists of three horizontal bands of sky blue (top, double width), yellow, and green, with a golden sun with 24 rays near the fly end of the blue band.Rwanda is an East African sovereign state, it is a small nation and officially runs on the democratic system. The bordering countries of Rwanda are Uganda, Tanzania, Burundi, and Congo. The terrain of Rwanda is diverse, mostly mountains and the subtropical mainland. The season is rainy throughout the year in most parts of the country, it is dry towards the south of the country. The official tongues of Rwanda are English, French, and Kinyarwanda. It gained independence from Belgium on 1stJuly 1962. 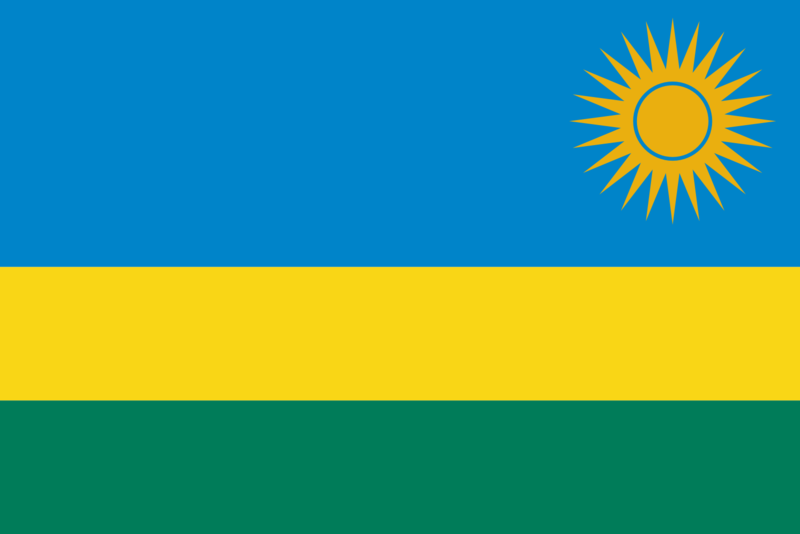 The state flag of Rwanda was adopted on October 25, 2001, as an amendment to the law. It is a horizontal tricolour with blue, yellow, and green colour and a yellow sun on a blue colour. The blue colour is of double width than the remaining two stripes. It was designed by a local designer and artist Alphonse Kirimobenecyo. All the three colors of the national flag of Rwanda and the sun represent different meanings. The middle band of yellow color and the sun shows the economic prosperity of the country. The green represents the greenery of the northern part and hope of development for the people of Rwanda. The sun symbolizes the enlightenment while the blue color is the happiness and peace of the country and people. E new flag emphasizes on unity, peace, and continuous work.